Colonial Americans found native cranberries similar in flavor to the lingonberries with which they had been familiar in Europe, although they quickly learned that the cranberry required quite a bit of sweetening. In the eighteenth century, cranberries were most often preserved or stewed to sweeten them for use in pies. This cobbler relies upon the apples and the oat topping to add sweetness to the cranberries and to create a light dessert that is pleasantly tart. Preheat the oven to 375°F. Grease eight 3 x 11/2-inch ramekins or one 11/2-quart shallow baking dish with butter. In a large bowl, combine the apples, cranberries, sugar, cornstarch, and cinnamon. Divide the mixture evenly among the prepared ramekins (or place in the baking dish). 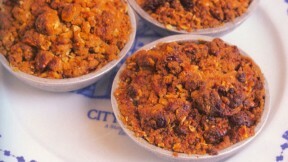 Top each ramekin with 1/4 cup of the Oat Topping (or spread all of the topping over the baking dish). Place the ramekins (or baking dish) on a baking pan. Bake for 25 to 30 minutes, or until the tops are golden brown and the filling starts to bubble. Serve warm. For the oat topping: In a medium-size bowl, combine the flour, oats, and brown sugar. Stir to combine. Transfer the mixture to the bowl of a food processor, add the butter, and process until the texture becomes crumbly. You may also do this by hand, cutting the butter into the dry ingredients with two knives. With a wooden spoon, stir in the walnuts. Use immediately, or transfer to a covered container and store in the refrigerator for up to 2 weeks.